Boy Abunda Death Hoax gone viral starting August 30 and the TV-host said that these are not new to him. He had sincerely forgiven those who had made the malicious stories about his deaths. The death hoax link have a caption "REQUEST NI BOY ABUNDA.....BAGO MANGYARI ANG LAHAT....., Request ni Boy Abunda" and uses Yahoo Philippines logo. In the exclusive video shown in The Buzz, Abunda divulged that he was not surprised that people were curious about his health and hospitalization. Then, here comes the fake news about his death that makes him saddened. The dead hoax link circulated was http://myhollyw00d. com/titoboy/, with the actual page showing same as the screen grab image below. 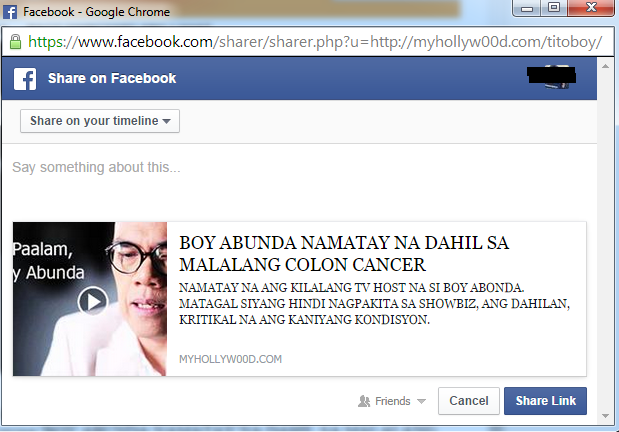 See actual screen grab image of the Facebook sharing option of Boy Abunda Death Hoax. This is an old scheme in social media that we should be aware of. In some cases, there are malicious contents and viruses sent to the computer of the one who is able to click the link and we should be aware of this in order to safeguard our computers and accounts. You have to verify first if the link is legit. You can probably ask someone who has an idea about the link so that you will not become an online moneymaker’s prey.